Boris Sichon Is a very accomplished bones player, and multi-instrumentalist. Check out a YouTube video of him demonstrating the bones, with a bit of him playing with the Irish band "Triska!" at the end. In September 2006, I got a set of bones from Clif Ervin, and they're quite nice. Clif plays on four tracks of Old Time Banjo by Allen Hart, including Chilly Winds and Josh Thomas's Roustabout, samples from the web page. I found out he lives just about 60 miles from me, and I saw his band The Lowdown Ramblers in October 2006, they were good fun. I talked to Clif and he told me of a recording of him and Dan Gellert playing Black-Eyed Susie, which is very nice! 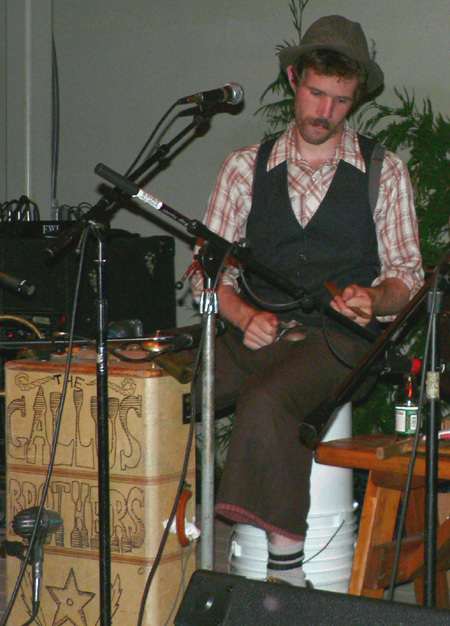 My pal Lucas Hicks plays a suitcase drumkit, including bones and spoons, in his band The Gallus Brothers. He also plays saxophone in Jill Brazil, and banjo in The Brent Coalminers and The Tanglers. I'll often sit in on bones in his groups. Good stuff all. Saltpeter is another group I play with, two guitars, bones, and occasionally banjo and concertina. Rough & tumble traditional songs, sea shanties, and ballads. Rhythm Bones Central, a large site with articles, an events calendar, and more. They sponsor the yearly "Bones Fest" on the east coast of the United States. Yahoo! Groups: rhythmbones, an online forum for bones players. Brother Bones (Freeman Davis), known for his whistling and bones playing on Sweet Georgia Brown, as used by the Harlem Globetrotters. This site has several sound samples from 78s. John Burrill, also known as "Mr. Bones." His playing with Spider John Koerner was the first I'd heard, and inspired me to learn about and to play the bones. Richard Thomas, one of many players known as "Mr. Bones." Stephen Brown, winner of the All-Ireland Bones Playing Championship in 2003 and 2004. Artis the Spoonman, who also plays bones, is an amazing player immortalized in the Soundgarden song Spoonman. I met him in March of 2004, gabbed a bit, heard him play, and took some photos. 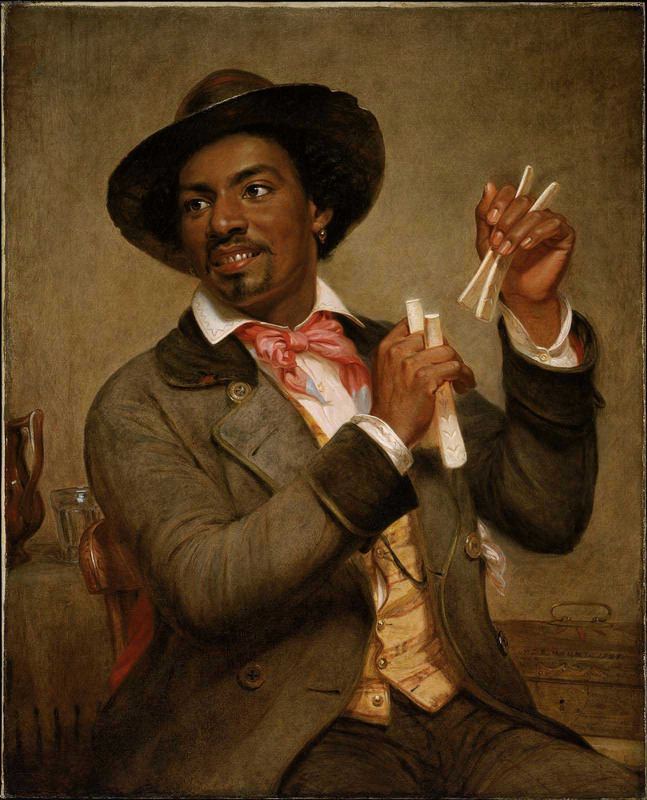 Ted Duckett was an accomplished English bones player and step dancer. Chlefeli are a Swiss folk version of the bones, also known as Klepperle in German. I found an audio sample (300K) of chlefeli playing on a Swiss website, from the album aus der Tellreihe: Glanzlichter der Volksmusik. You can also buy them there (for about $20 a pair). Here's some more information and pictures. SwissFolklore. 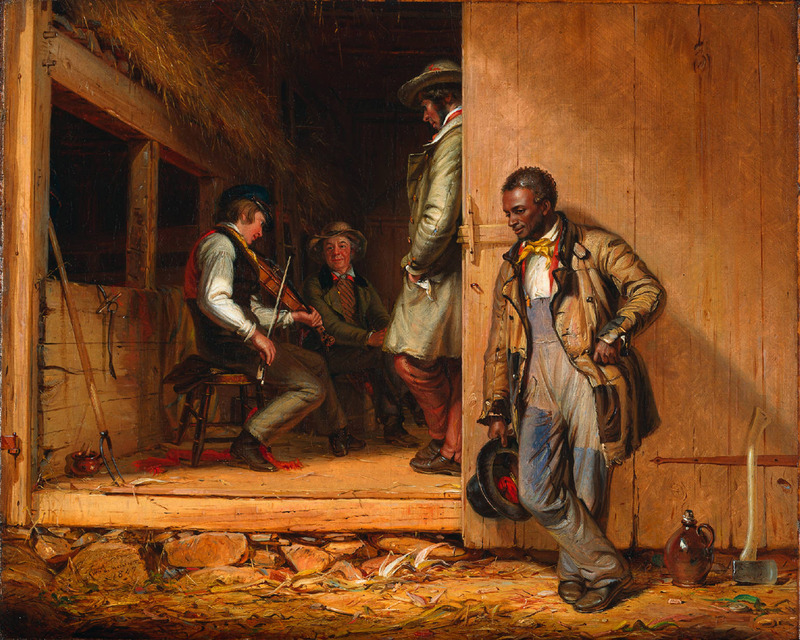 William Sidney Mount was an American painter and amateur musician, whose paintings The Bones Player from 1856 and The Power of Music from 1847 are favorites of mine. Rap, rap, rap, rap on your minstrel bones, a novelty recording from 1912. There are many great recordings on this site.